With the weather getting cooler and the leaves starting to change, there’s never been a better time for a scenic bike ride to check out that awesome fall foliage. So, get the road bike or mountain bike out of the garage, put on that helmet and take your pick from one of the scenic bike rides listed below. The East Coast does some of the best fall scenery and this trail certainly does not disappoint. The entire trail length is just over 34 miles. It starts up in Abingdon, Virginia and ends over by the border with North Carolina, just past Whitetop Station. The trail takes you through the town of Damascus, Virginia, which helps to maintain it along with the town of Abingdon. It was created back in 1984 and though it is on public land the whole way, it does back up to private land, so be respectful if you set out on this ride. You can plan your ride on their official website. Having lived in Kansas a few years back, I can tell you that the scenery does not compare to what you get on the East Coast, but this is still a nice ride in the fall. One of the best things about this trail is that like most things in Kansas, it is very flat and that makes it accessible to riders of all ages. 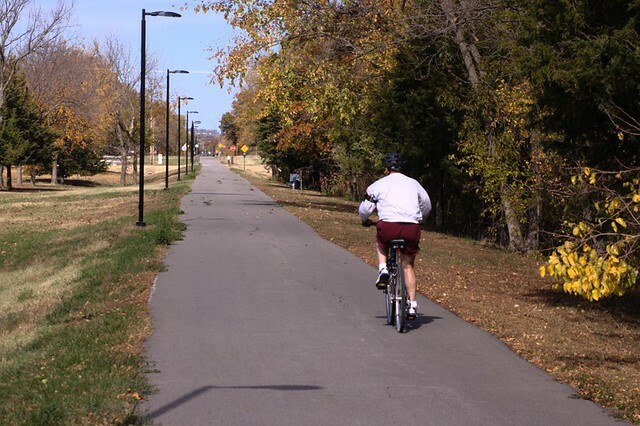 And according to Kansas Cyclist, this trail is actually the very first big rail-trail conversion that the state did. So, if you’re a railroad enthusiast, then that might interest you. This trail didn’t open up until 1996 and it covers a distance of about 50 miles between Ottawa and Iola. You get to go over a lot of bridges on this trail and see a variety of nice scenery. There are also nice rest areas with bathrooms spaced throughout the trail. Learn more at the official website. There is no denying that you get the best fall color display from the trees in the New England states. 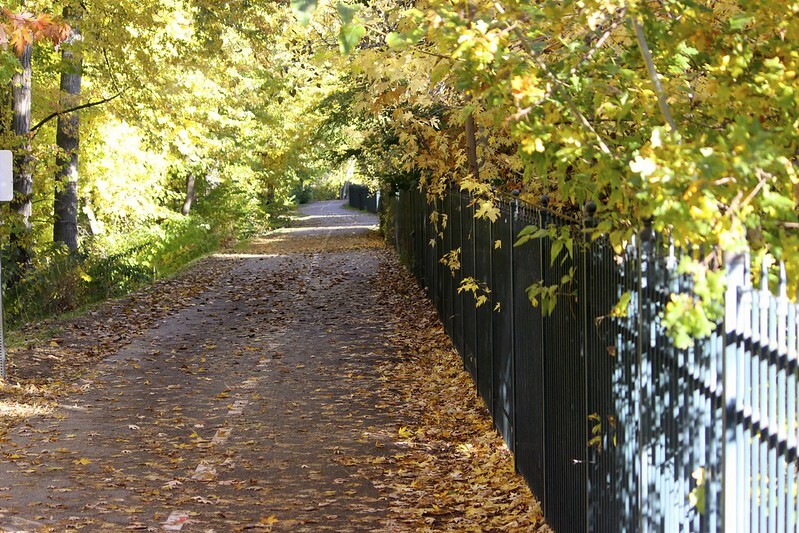 And the Farmington Canal Heritage Trail gives you a great view of those changing leaves this time of year. This 84 mile trail runs between New Haven, Connecticut and Northampton, Massachusetts. It sits where on the old Canal Railroad used to be and is now a mostly paved trail for bikes, walks, runs and blades. Get a map on the trail’s official site and get ready for some awesome autumn views. Having lived in Columbus, Ohio, I can confirm that they get some pretty decent displays of autumn colors on the trees. And this 78-mile trail from Cincinnati to Cleveland is a great way to get off the beaten path and take in some of nature’s finest displays this time of year. Most of the trail is paved and officials plan to extend it to cover around 400 miles eventually. For now, you can enjoy the passing farmland, villages, bridges, parks and nature preserves on your ride. Visit the official site to get a map before you leave home. 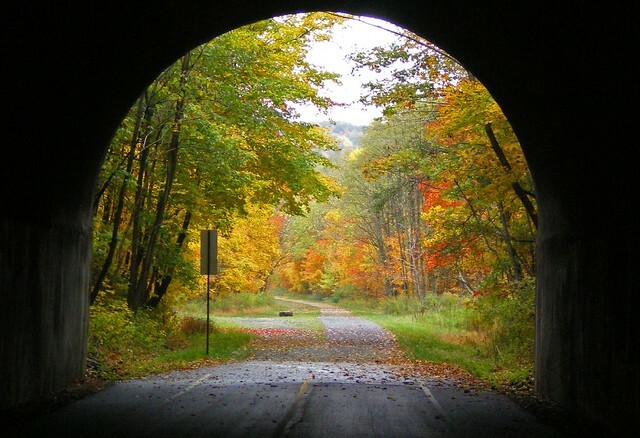 From Cumberland, Maryland to Pittsburgh, Pennsylvania, this 150-mile trail takes you through tunnels, past river and streams, active railroad tracks, farmland, cute villages, and other picturesque scenery. This ride is not short on photo ops, so be prepared to be wowed by what you see. And if you want a longer ride, this trail does connect with the 184.5-mile C&O Canal Towpath to get you from Pittsburgh to Washington, DC. Get maps on the official trail site before you set off. Probably my favorite small mountain town in all of Colorado, there are plenty of trails in Steamboat Springs for both road bikes and mountain bikes. Some of the best trails take you through Routt National Forest, which has both road bike and mountain bike trails (see their website for trail info). 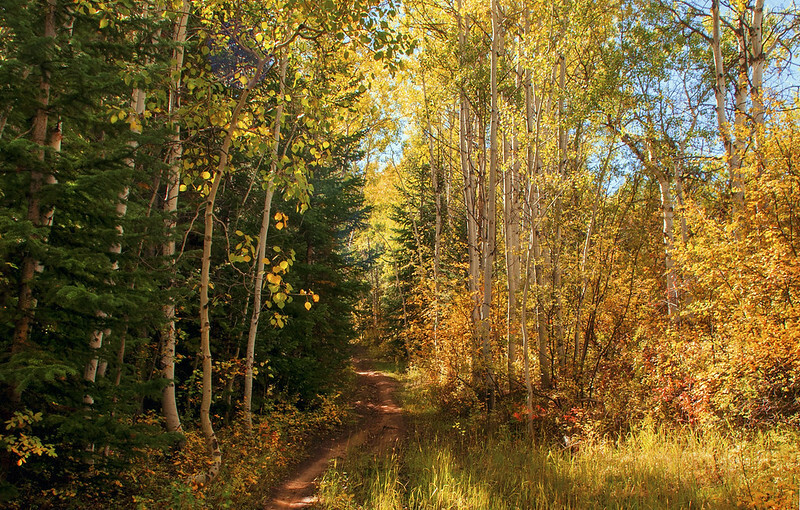 The trails in Steamboat Springs take you by rustic old wooden bridges, beautiful aspens, small steams, rocky terrain and other bits of nature that make Colorado so special. The Chamber of Commerce website has maps and more info on all the trails in Steamboat Springs. 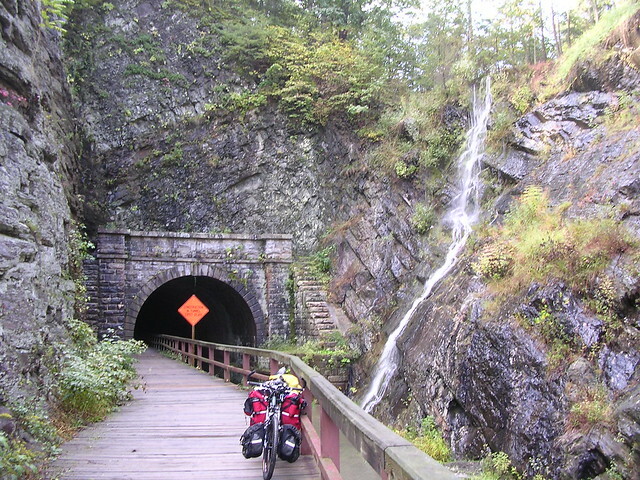 Covering almost 185 miles, you can take this trail between the cities of Washington, DC and Pittsburgh. What’s really nice about this trail is that is takes you along the Potomac for some of the most amazing fall colors by the water. There’s plenty of picnic areas along the path, so be sure to pack a lunch before you head out. Visit the official website to get maps and other visitor information. If taking in fall scenery with ocean breezes hitting your face sounds like your kind of ride, then you will not want to miss this trail. It covers 22 miles and takes you by the waters of Cape Cod, marshes, forests and bogs. 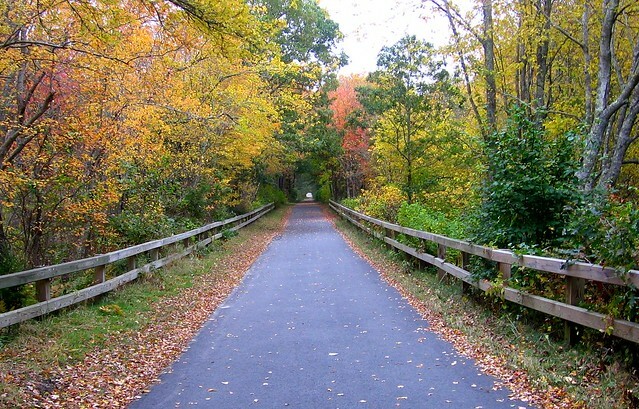 This paved trail follows the Old Colony Railroad starting at South Dennis and ending at South Wellfleet. Keep in mind that the South Dennis trailhead is the busiest part of the trail. And once you reach South Wellfleet, if you continue, then you will get on the lengthy East Coast Greenway. Get your trail map on the official website. 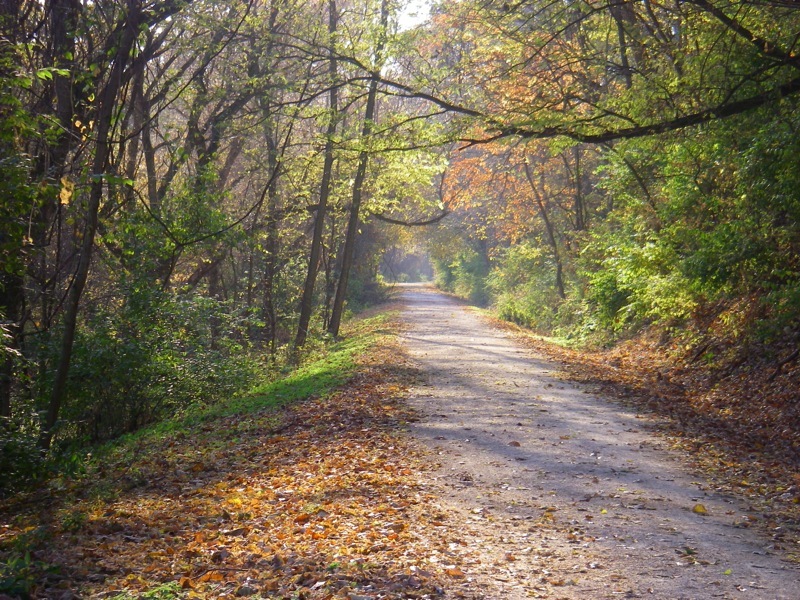 If you’re in Missouri and the Prairie Spirit Trail is too far away for you, then consider the Katy Trail instead. This one starts in Clinton and takes you 230 miles east all the way to Machens. Most of the way you’ll be keeping up with the Missouri River, which makes for some great views. 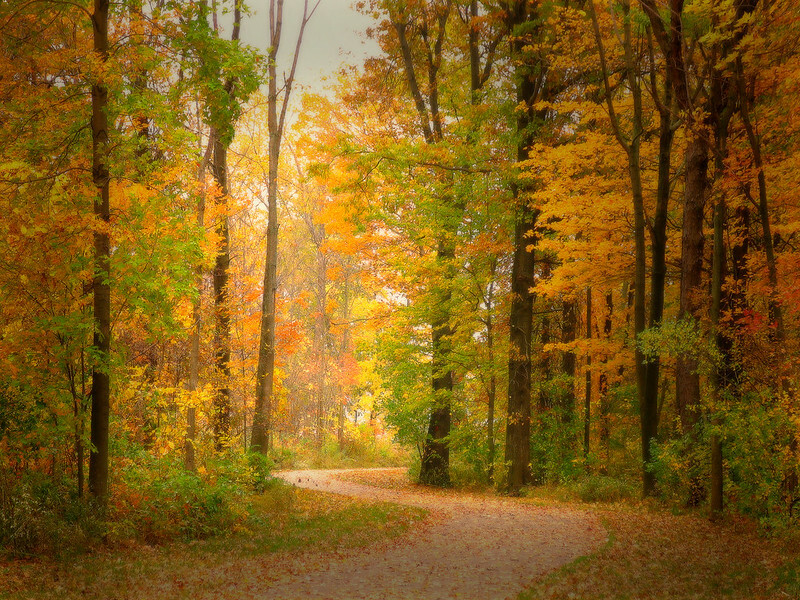 You’ll have plenty of trees around you with bright autumn colors, so remember to bring along a camera. Get maps and more information on the official website. If you prefer mountain bikes to road bikes, then this epic trail is not to be missed. In total, it covers about 500 miles between Durango and Denver. You get picturesque views of mountains, ample forests and an elevation over 13,000 feet. But this trail is no joke – it is narrow and dirt, which is why you need a mountain bike for it. It is also very popular with hikers and backpackers, so do expect to encounter other people on your journey. If you can do it though, it is definitely not one to be missed. Get a trail map and more information on the official website. In Boise, when the leaves start to change in October, the Boise River Greenbelt is a great place to take the season’s colors. This 25-mile path takes you right through the city’s heart, as well as giving you great views of the river and area nature parks. It stretches from Esther Simplot Park to Alta Harris Park. For a map, visit the official site. 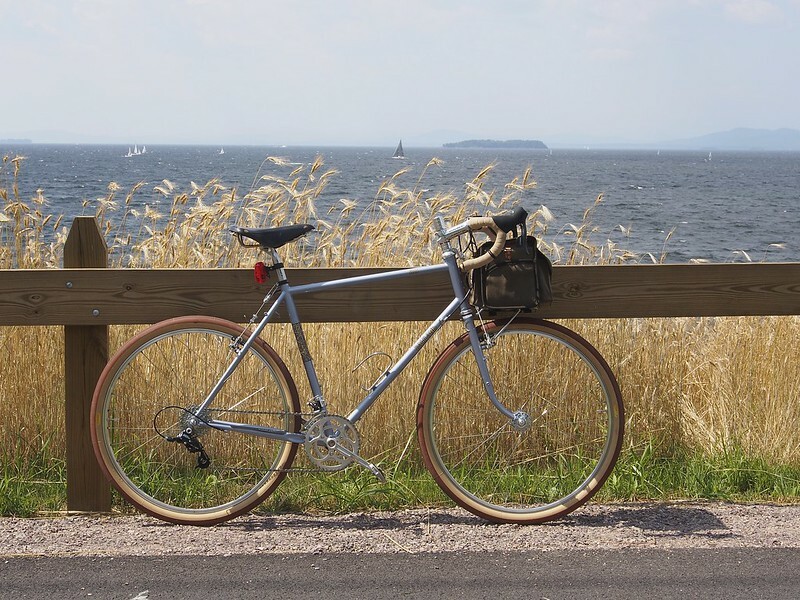 If you’re looking for some of the finest scenery in the New England states, then the 363-route Champlain Bikeway lets you take your pick of scenic trails in the Vermont area. Vermont’s Champlain Valley is a favorite fall destination among cyclists ,with travel company VBT – Bicycling and Walking Vacations – selling out guided tours each year. The entire network of trails stretch around the lake and take you along the Richelieu River in Quebec. 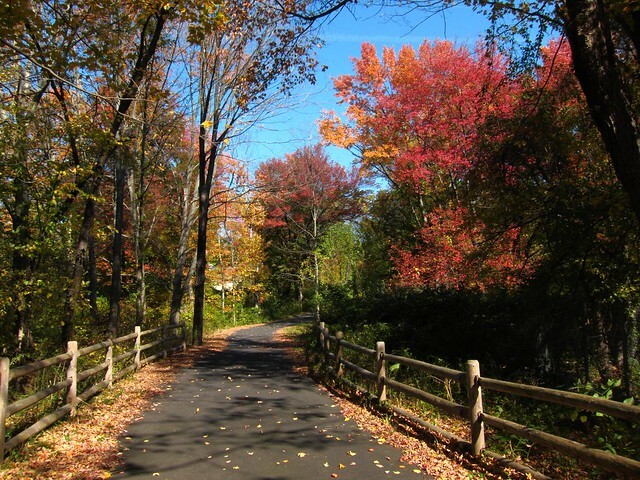 If Burlington is your base, a good trail to take for the fall scenery is the Island Line, which overs 14 miles from Burlington to the Colchester Causeway along the old Rutland Railroad. For late September to mid-October is when you’ll get the best color displays from the trees. Get maps and trail info on the official website. Located in the Black Hills National Forest in South Dakota, this entire trail goes on for 111 miles. And, it is best suited for mountain bikers. If you don’t want to bike the entire thing, the popular section is is about 12 miles round-trip and should take you around three hours. Use the Dalton Lake Trailhead to access the bike path in Nemo, South Dakota. If you head north on the path, you’ll come to Dalton Plateau in about six miles, which gives you amazing views not only of the trees in their fall colors, but all some of what makes the Black Hills so famous. For peak scenery, do this trail in late September. Learn more from the state parks website. If you’re in the Asheville, North Carolina area then the Tsali trails are a good choice for you. They are located near Bryson City, the Great Smoky Mountains National Park, and Cherokee. All the trails offer a chance at seeing some great fall colors from your mountain bike, and I’m a really big fan of the views that you get of the trees around Fontana Lake. The trails are hardpacked and maintained pretty well. There are four different trails and the National Forest requests that mountain bikers only use the trails on certain days of the week to make it easier for hikers to navigate them. You can get trail maps and more details on the National Forest website. One of my favorite places for awesome scenic views is Vail, Colorado. If you visit in the fall, you can take advantage of lower lodging costs and see some of the best views that nature has to offer. 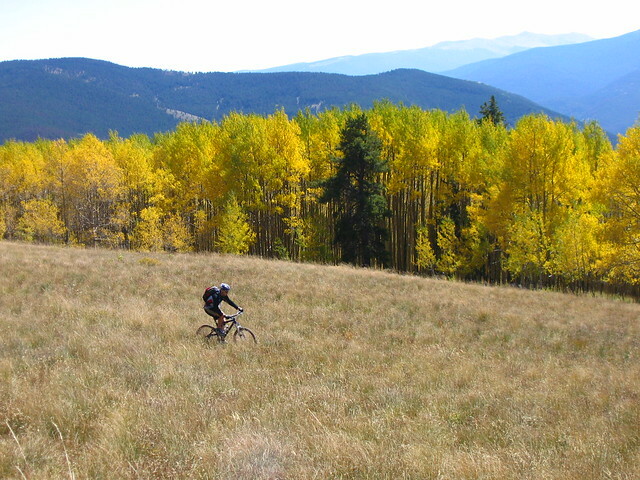 While you can easily get around Vail Village on a road bike, the trails are definitely intended for mountain biking. You got over 15 different trails to choose from and you can rent a bike in Vail Village if you don’t have one with you. Once you’re ready, just take the gondola up to the top of the mountain for even more great views before you ride back down it. Get more info on the trails from the official Vail website. No matter what are of the United States you might be in this autumn, there is certain to be a great trail nearby where you can hop your bike and take in the best that nature has to offer this time of year.